December | 2011 | ohdenny. One of things I’ve realised from making a nice tasty homemade pizza is that it doesn’t really come cheap! Unless you make huge batches it won’t necessarily be budget friendly but of course this depends on the ingredients you use. On the plus side these pizzas were worlds apart from the fast food pizzas such as Dominos. They really can’t compare to a homemade pizza at all. 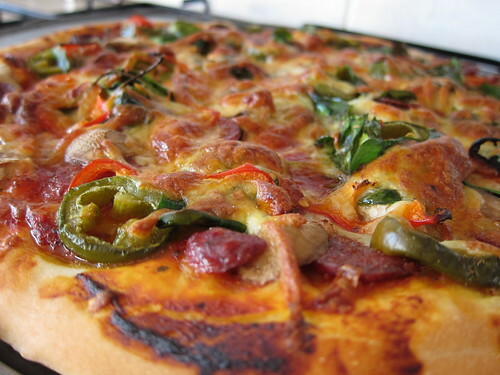 I’ve taken this recipe from Jamie Oliver‘s website, which I believe is in the Jamie At Home cookbook, and I have now made pizza a couple of times with this recipe so for me, it works quite well, and is very easy to do. Here is the recipe I’ve used below. 1. Sieve the flour/s and salt on to a clean work surface and make a well in the middle. 2. In a jug, mix the yeast, sugar and olive oil into the water and leave for a few minutes, then pour into the well. Using a fork, bring the flour in gradually from the sides and swirl it into the liquid. Keep mixing, drawing larger amounts of flour in, and when it all starts to come together, work the rest of the flour in with your clean, flour-dusted hands. Knead until you have a smooth, springy dough. 3. 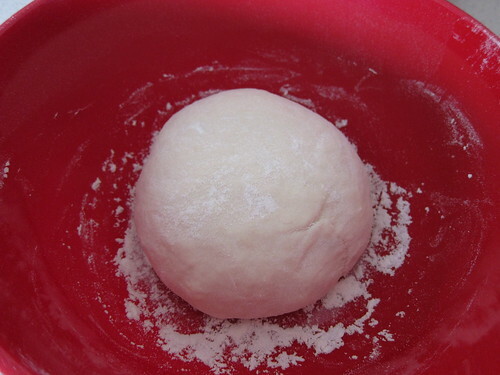 Place the ball of dough in a large flour-dusted bowl and flour the top of it. Cover the bowl with a damp cloth and place in a warm room for about an hour until the dough has doubled in size. 4. Now remove the dough to a flour-dusted surface and knead it around a bit to push the air out with your hands – this is called knocking back the dough. You can either use it immediately, or keep it, wrapped in clingfilm, in the fridge (or freezer) until required. 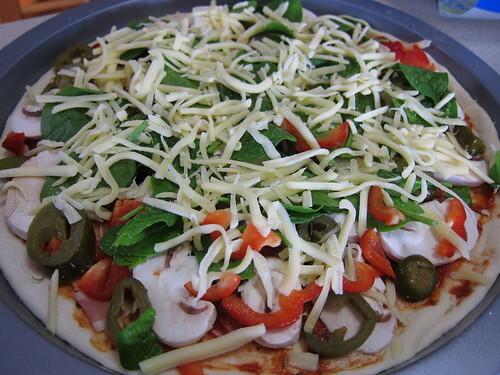 If using straight away, divide the dough up into as many little balls as you want to make pizzas – this amount of dough is enough to make about six to eight medium pizzas. With these pizzas the toppings are all up to you and the beauty of it all is you can add as little or as much as your want! I halved the above recipe and used semolina and it made two large(ish) sized pizzas so you can take that into consideration. I’ve listed the ingredients I’ve used below. Here is a recipe from Taste.com.au which you can use to go by for oven temperature and general how to. 2. Place the pita pockets on a large baking tray. Spread with the tomato tapenade. 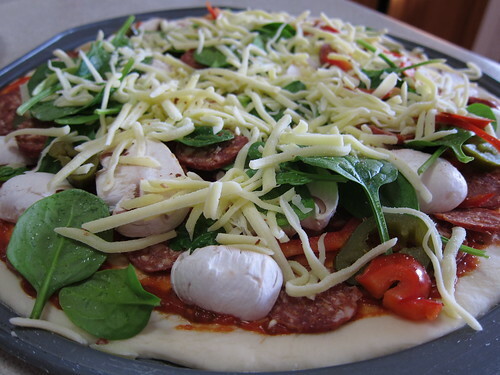 Top with the chorizo, capsicum and bocconcini. Sprinkle with the parmesan. 3. Bake in oven for 10 minutes or until the parmesan melts and the base is light brown and crisp. If tomato tapenade is unavailable, use tomato paste. Shopping tip: Look for tomato tapenade and bottled roasted capsicum, sometimes called fire-roasted peeled peppers, in the antipasto section at Woolworths, near the olives. Swap it: For a different flavour, swap the tomato tapenade for bought basil pesto and swap the chorizo sausage for coarsely chopped ham slices. I really liked the Jamie Oliver pizza dough recipe, it works wonders. However to be honest, I haven’t tried any others when this one worked well for me. It has a nice crunch on the outside and it lovely and soft inside, plus if you cook it long enough the base crisps nicely and it is just fantastic. Basically you leave it in the oven at roughly 200 degrees fan forced if you have ingredients that don’t need much cooking (or really none at all). 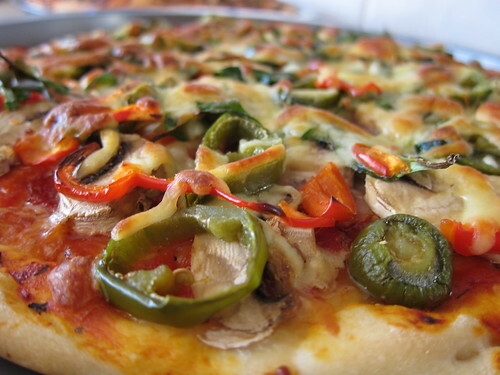 If you do have toppings that may need to be cooked, please pre-cook them to be safe, and so the dough is well cooked while the toppings aren’t overly over cooked. It’s a great recipe that I’ll be using more regularly from now on! There is just something about Thai food that I love. I think it’s probably how well balanced their food seems to be. 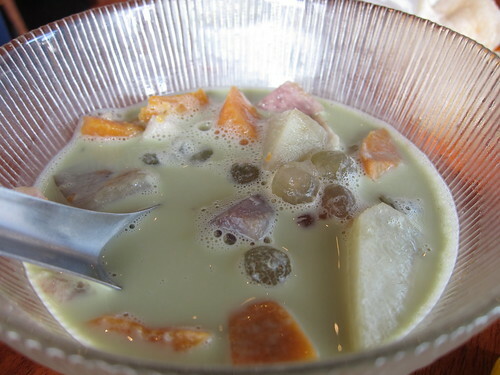 It has this perfect blend of sweet, sour, salt and spice. 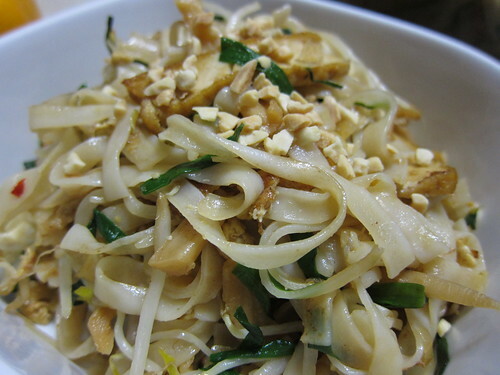 Pad Thai is a rice noodles stir fry that incorporates the many commonly used Thai ingredients such as tamarind paste, fish sauce and chilli along with a mix of eggs, preserved turnip, nuts, tofu and shrimp. I’ve used the SBS Food’s Pad Thai Recipe and made slight changes to my preferences. 1. Soak the tamarind in warm water, kneading with your fingers to separate the pulp from the seeds. Squeeze out liquid, strain and pour into a frying pan or wok. Add palm sugar, caster sugar and seasoning sauce. Bring to the boil and boil until it has reduced and is syrupy. 2. Fry prawns until they curl and change colour. Add dried shrimp, red onion, tofu and preserved turnip. Push contents of pan to one side and add egg, breaking up just a little as it cooks. 3. Add drained noodles, 2 tablespoon of water, the tamarind sauce, garlic chives and a few bean sprouts, fried shallots, chopped peanuts and chilli. 4. Pile into a serving bowl and garnish with more fried shallots, bean sprouts, a wedge of lime, garlic chives and crushed peanuts. 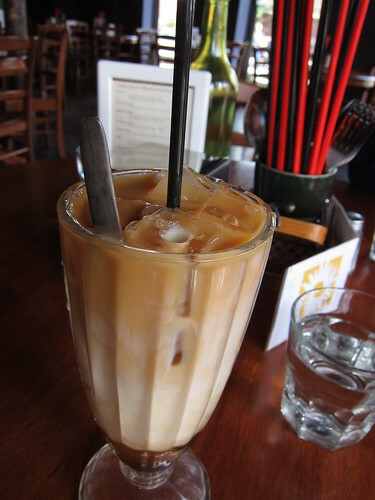 The amount of sauce added to the Pad Thai can be adjusted according to how strong a flavour you like. Usually this quantity of sauce is fine for 4 people. 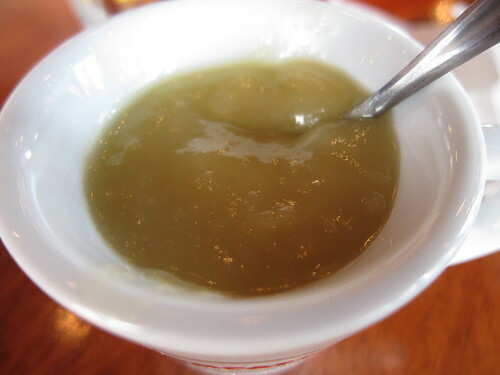 Any unused sauce can be kept in a clean jar in the refrigerator. I quite liked this recipe, it’s quite easy to make actually, and I actually used a lot of the sauce because we used the whole packet of rice noodles (Much larger than 200g). I have a slight dislike of all things coriander so I’ve neglected to add it here, but I can see how it can make this dish a bit more refreshing with coriander added to it. I think I also may have added too much dried shrimp so the Pad Thai ended up having a strong shrimp taste, but it still tasted nice and light. It tasted similar to what I’ve eaten at Thai restaurants but I can’t really tell whether or not it’s truly authentic or not but it tastes great so that’s all that matters to me! 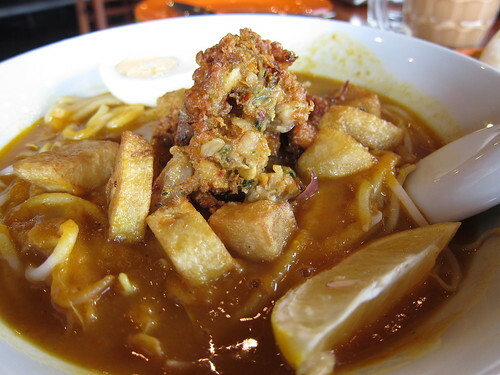 Taste of Singapore is located on Clayton Rd, not too far away from Monash University’s Clayton Campus. 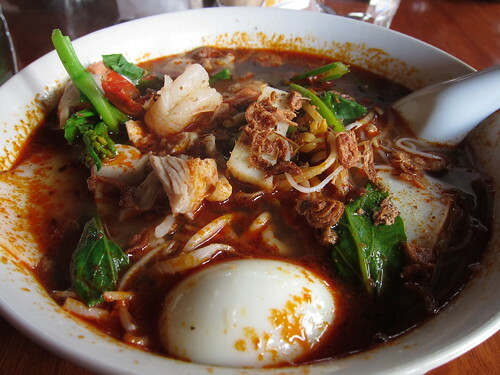 If I’m craving Malaysian food and can’t find it anywhere, Singaporean cuisine will satisfy my cravings. 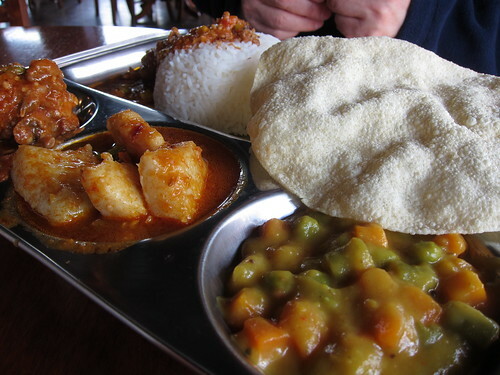 What I’ve noticed between Singaporean and Malaysian cuisine is that Singaporean food is usually slightly sweeter but of course that can depend on where you frequent. What I found with Taste of Singapore is that it had fantastic flavours and yet wasn’t that sweet like most Singaporean food I’ve tried. 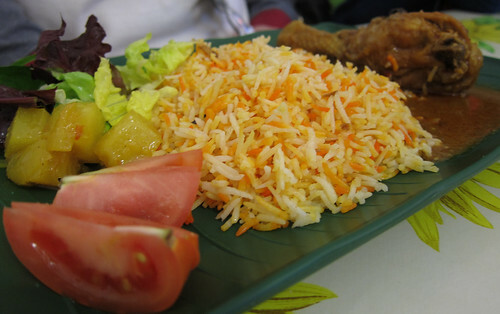 Taste of Singapore serves quite a few well known dishes along with some not so famous dishes such as Nasi Lemak, Murtabak and Nasi Briyani. 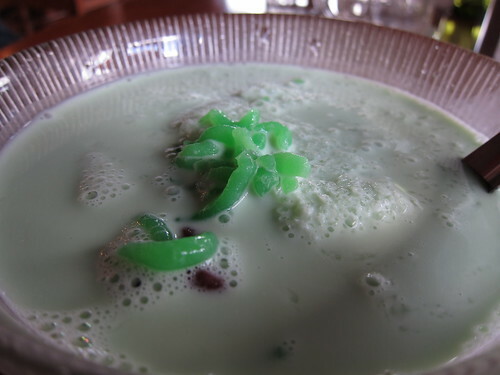 They also offer some sweet treats like Kueh and Teh Tarik! 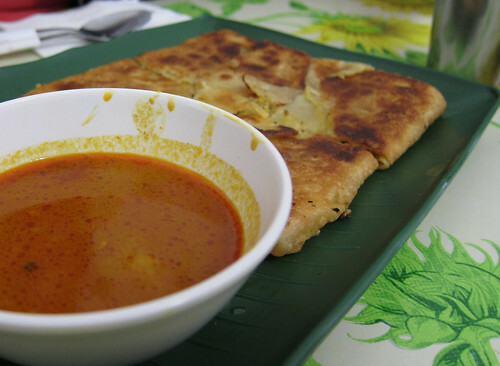 Murtabak, as shown in the first image, is similar to Roti Canai but has a meat and onion filling. Usually this will be either lamb or beef. I’d probably go for their lamb but I know a few people who can’t quite stomach the lamb flavour. Their Murtabak was very good, I do enjoy a crispy thin roti to dip into a spicy curry sauce and this dish met all my requirements for a great Murtabak. 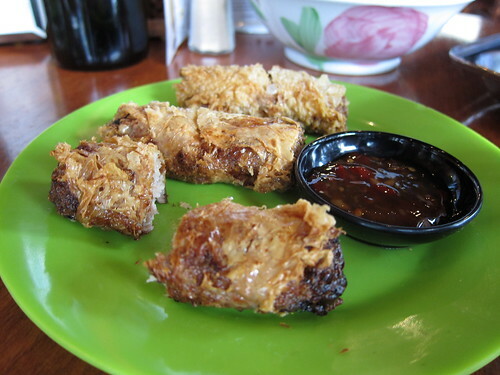 You also hardly ever can find a restaurant that sells Murtabak in Melbourne. So luckily it didn’t disappoint! Taste of Singapore’s Nasi Lemak was surpisingly decent. Along with their cheaper than average, their serves are proportionate to their price. The Beef Rendang was cooked well and not too tough like some Rendang’s I’ve tried and the sauce had great authentic flavour to it too. What was the biggest surprise was their chilli sauce/paste. I was expecting something sweet and not very spicy but this packed quite a good punch along with its sweetness so it balanced out nicely. 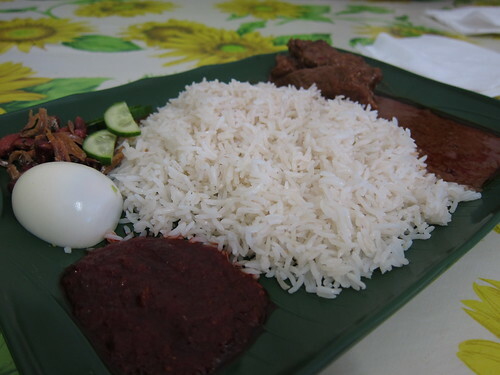 The usual assortment of egg, cucumber, anchovies and peanuts are mostly standard with what you get in any Nasi Lemak. I don’t think you can really go wrong with that. 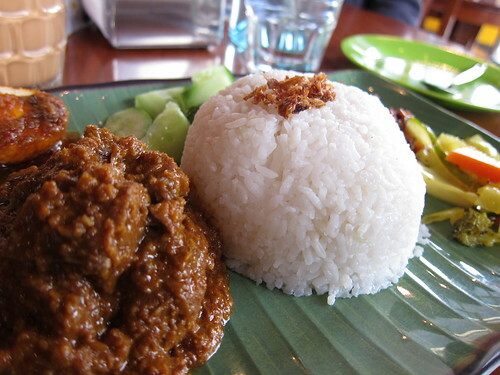 Overall their Nasi Lemak is probably one of the better offerings I’ve tried in Melbourne. 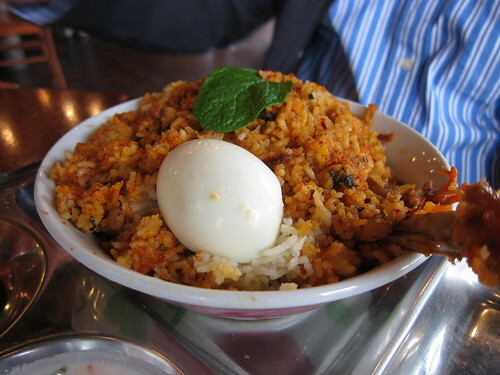 I was pleasantly surprised at how nice the flavours are from the Nasi Briyani, while the rice looks plain enough it has good flavours to it. Although their serving size is less than desirable and with only one skinny chicken drumstick, I don’t think it’s value for money to be honest. 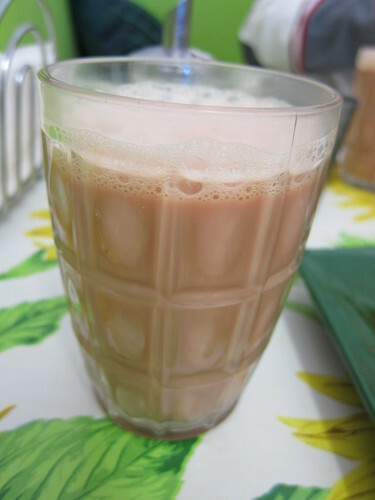 Oh Teh Tarik, how I love thee, and especially a good one. 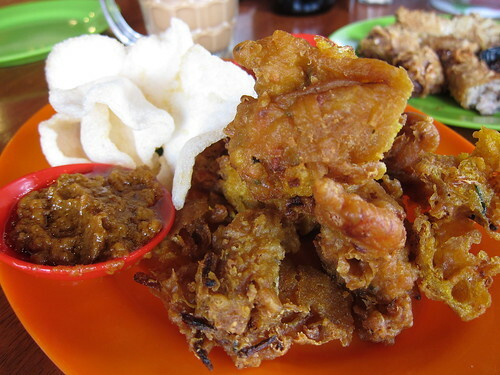 Taste of Singapore’s offering is one of the best I’ve tasted, probably up there with Chillipadi. 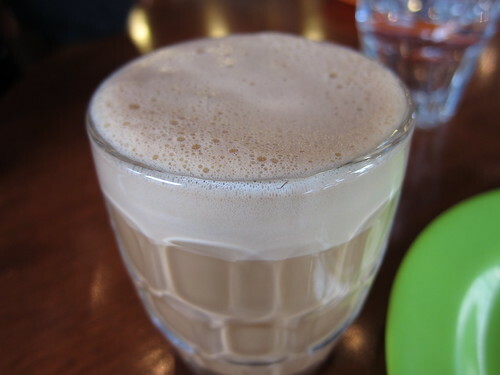 It has a nice frothy top and it’s also not too sweet. A definite must try. Here is one of their Kueh offerings on my Saturday visit. It was so-so. What I didn’t like about it was how sweet it was. 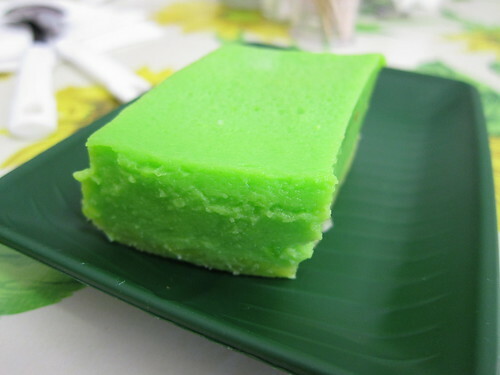 It just overpowered any flavour that the Kueh was supposed to have. The one upside is that the texture was quite nice, it was slightly chewy but mostly soft like jelly. 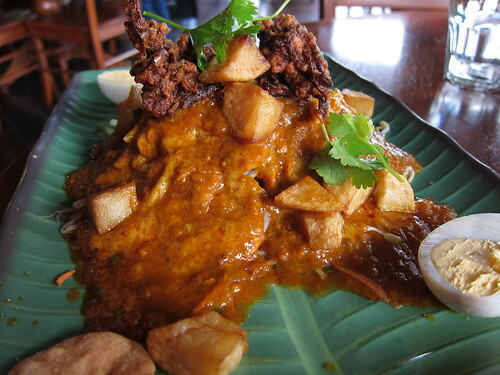 Taste of Singapore has great flavours and although there are some cons with a few of their dishes, it does have a lot of upsides so I’d recommend you give it a try. 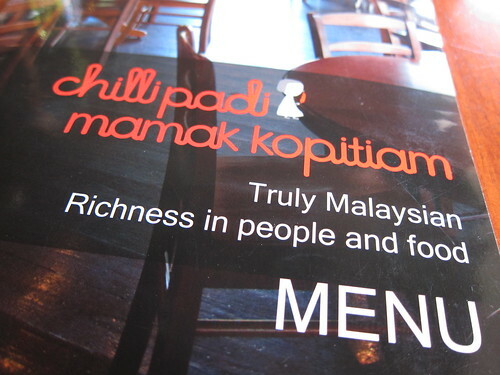 The Singaporean chef is also quite friendly to chat too, so it has a great atmosphere to boot. However, I’ll admit the decor leaves a little to be desired.